Sammy takes a wild trip to Las Vegas to detour her mother’s plans to wed Sammy’s boyfriend and Casey’s father. Narrator Tara Sands has been voicing Sammy for many adventures, and listeners will find her perfect blend of snark and vulnerability just right for this popular character. Whatever Sammy’s mood (and she is a 13-year-old with ever changing emotions), Sands nails it. As Sammy comes closer to unraveling the biggest mystery of her life, she joins forces with her archenemy Heather and her disapproving mother, receives aid from an army of Elvis impersonators, and attends an unexpected wedding. Through it all Sands goes from voice to voice with ease, never stumbling as she transitions between characters. 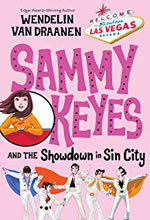 Verdict: Fans of the series will love the latest installment, but first-timers may want to start with Sammy’s first case (Sammy Keyes and the Case of the Hotel Thief) and work their way up to this one. Narrator Tara Sands establishes a girlishly pitched dramatic voice for young detective Sammy Keyes, who follows her mother and her mother's boyfriend to "Sin City" to try to keep them from eloping. Along the way, Sammy runs into an entire cast of characters, including her best friend, Marissa, and her worried mother; her soon-to-be stepsister (and arch nemesis), Heather; her soon-to-be stepfather's ex-wife; a smooth-talking Elvis impersonator; and her soon-to-be-stepfather himself, each portrayed perfectly by Sands. Both new listeners and long-time fans of Sammy Keyes will eagerly follow each twist and turn until she finally encounters her mother and learns the truth behind a secret that has been hidden for the past 13 years.